Photos courtesy of Capital Painting & Decorating, Inc.
Ulysses S. Grant was a victorious Civil War general who saved the Union and became the 18th President of the United States in 1869. Prior to the war, he met his future wife at her family home in St. Louis, Missouri, where both families lived for years. While these historical figures have long since passed on, the home lives on as a tourist site run by the U.S. National Park Service (NPS). As such, keeping the nearly 200-year-old historic building operational requires major maintenance efforts, considering the desire for the site to accurately reflect its time period. Fortunately for the NPS, a five-person crew from regional contractor Capital Painting, Inc. embraced the challenge. “It was a very unique project,” said Scott Miller, company president. “It’s not like painting a commercial or office building. It’s a historic feeling. We sent about half of our guys, and I just went out with them because I wanted to be there. You’re standing on the porch and you’re looking onto the same land that was there in the 1800s so you think back. That was the middle of a plantation, with slaves at the time. It was just surreal to paint an ex-president’s home that was part of the Civil War.” Surreal indeed. Specifications called for the home’s exterior wood siding, soffits, doors, shutters, windows, and decks to be coated with a two-coat system for protection from the elements — along with the appropriate aesthetics of high-gloss green paint. “The house was originally white, but Grant had it painted Paris green,” Miller said. “Vivid colors in the 1800s meant you were wealthy, and that showed an example of wealth. And high-gloss paint was what they used during that period.” Interestingly, the house is named “White Haven” for the family of one of the home’s earlier owners. Work was completed over a six-day period in September 2017 when weather was mild and dry; however, since the project took place outside, this meant the home’s interior could remain open to tourists. Naturally, the steady stream of people created a logistics challenge for the Capital Painting crew. “I should know the entire speech by now,” Miller joked, referring to the tour guides. Capital Painting, now in its 13th year of existence, had an existing relationship with the NPS from prior projects — and that trust paid off, given the tourism concerns. To keep the site resembling its era as closely as possible, preparation and application methods needed to reflect the original time period. For the Capital Painting crew, this was quite a change from a typical job! Personal protective equipment (PPE) was minimal, effectively consisting of just gloves and boots because they were not allowed to use complex modern equipment. Workers also scraped down any loose paint using hand tools from Purdy. “They did not have a surface profile, because in the 1800s, there wasn’t really a standard,” Miller explained. On the second day, the crew spot primed the raw areas where paint had fallen off using the Sherwin-Williams A-100 Exterior Fast Dry wood primer, applied with 3-inch (7.6 cm) Purdy Swan brushes at approximately 4 mils (101.6 microns) of wet film thickness (WFT). Werner ladders were used to allow workers to reach higher areas. “It wasn’t 100 percent coverage with the primer,” Miller said. “Just spot coverage as needed for the raw areas.” The deck was primed after the last tour of the second day, allowing it to cure overnight without anyone walking on it. The final four days of the assignment consisted of hand-painting the home. Sprayers were not an option, again for historic reasons, so the crew used the same Purdy Swan brushes all around. Doors, windows, shutters, and siding received two coats of Sherwin-Williams’ SuperPaint Exterior Acrylic Latex, designed to retain color and resist fading and peeling. Each coat, applied at approximately 4 mils (101.6 microns) WFT, cured within hours before the second coat was brushed on the next day. For the porch areas, the decks and stairs were coated with two coats of Sherwin-Williams’ Porch & Floor Enamel — each also at an average of 4 mils (101.6 microns) WFT — along with a non-slip sand additive to prepare those areas for foot traffic. As it turned out, tourists weren’t the only obstacle on this project. The “White Haven” home is located adjacent to Grant’s Farm, now operated by Anheuser-Busch Brewing Company. As such, the farm is home to a wide variety of animals, including the famous Budweiser Clydesdales. While the horses didn’t make it to the jobsite, a few other animals did! For the crew, the novelty of this job made the experience even more memorable — and perhaps even inspired their great work. That back-to-basics approach certainly paid off, even on a job that was anything but. 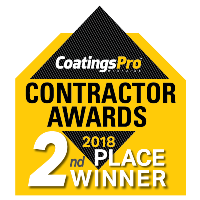 Editor’s Note: Capital Painting won 2nd place in the Specialty Project category for CoatingsPro’s 2018 Contractor Awards Program for this project. Congrats to the crew!